Today is Thiruvadhirai day. Woke up early and prepared thiruvadhirai kali to offer to Lord Shiva. Thiruvadhirai is a festival that popular among the Hindu community in Tamil Nadu and Kerala, the two southern states of the Indian subcontinent. It comes on the full moon day of the Tamil month of Margazhi (around December-January) and also on the day of adhirai star. Thiruvadhirai = Thiru + Adhirai. Adhirai is Lord Shiva's birth star and thiru is is added to it to give a sacred feeling. (which gives the meaning of 'holy' or 'sacred'). This day is also called as Aruthraa Dharshanam. On his birthday, Kali (rice and dal mixed paste), Adai (rice pancakes) and Curry with 7 vegetables will be offered to him. I am sure every home will be preparing their own version of thiruvadhirai kali. We usually prepare Ulundhu kali(Ulunthan kali) on this day. Apart from this special occasion, we prepare this kali for breakfast at our home. Due to its protein rich health benefits, it is being served to girls after they attain the age(puberty) to strengthen their back bones. 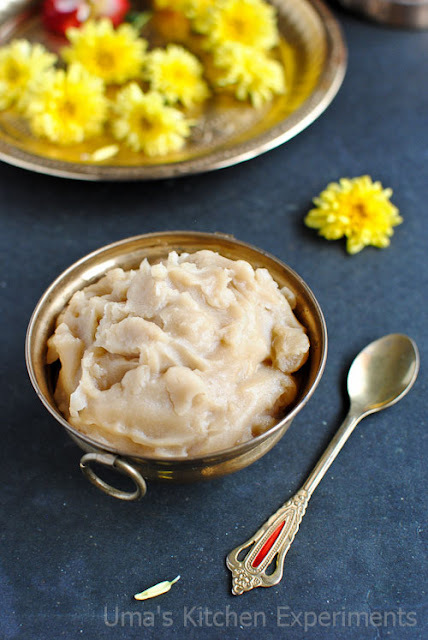 We usually mix both the rice flour and urid dal flour of equal quantity to make this kali. I always have this flour mixture at home to prepare it often. So I have skipped the picture for it, but I have explained it briefly below. 1) Take equal quantity of rice and urid dal. No need to roast it. 2) Make a smooth powder of it using the mixer/food processor. 3) Store it in a air tight container and use it whenever you need to prepare kali. 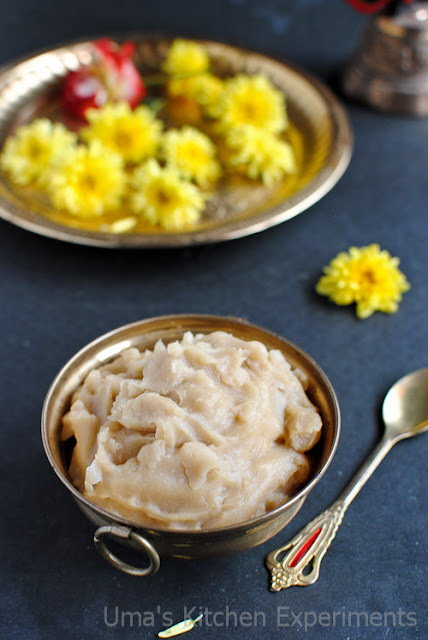 1) Mix Jaggery, cardamom and dry ginger powder with 1 cup of water in a saucepan and heat it. Once the jaggery dissolved, filter it to remove the impurities. Keep it aside. 2) Take a heavy bottom wide pan and mix remaining water and flour together. Make sure not to form any lumps. As I don't have any heavy bottom pan with me, I used pressure cooker bottom without lid. 3) Keep this in flame and stir continuously using a long spatula. 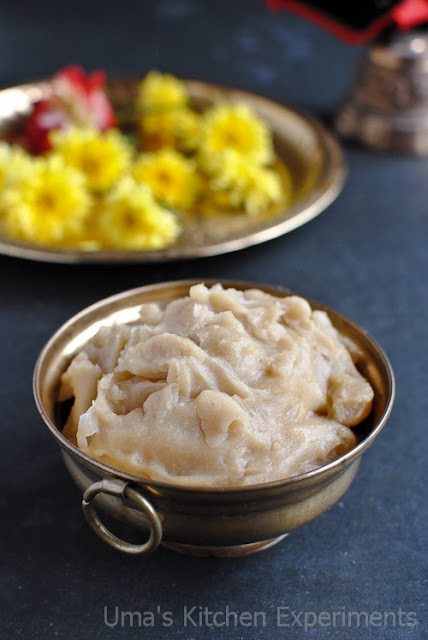 4) When the flour mixture slightly thickens, add the filtered jaggery to it. 5) Keep stirring continuously till it reaches thick smooth consistency. Whenever the flour mixture sticks to the sides of the pan, pour a teaspoon of oil and stir it. 6) Add the remaining oil before turning the flame off if any. 1) Increase or decrease the sugar as per your taste. 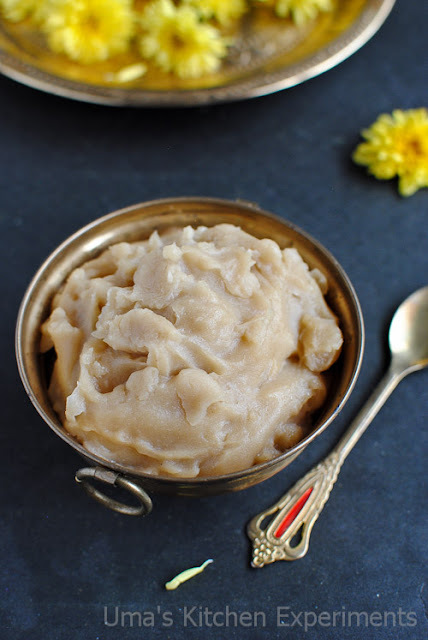 2) I added karupatti vellam* to prepare this recipe.You can add any type of vellam to make this recipe. 3) Addition of cardamom and ginger powder are optional. 4) Use gingerly oil or sesame oil for authentic taste. Never heard or tasted this..a very nice traditional recipe & nicely presented!! Such an authentic dish,healthy and definitely delicious. First time here, But your blog is totally different from others..your layout looks stunning and happily following it..